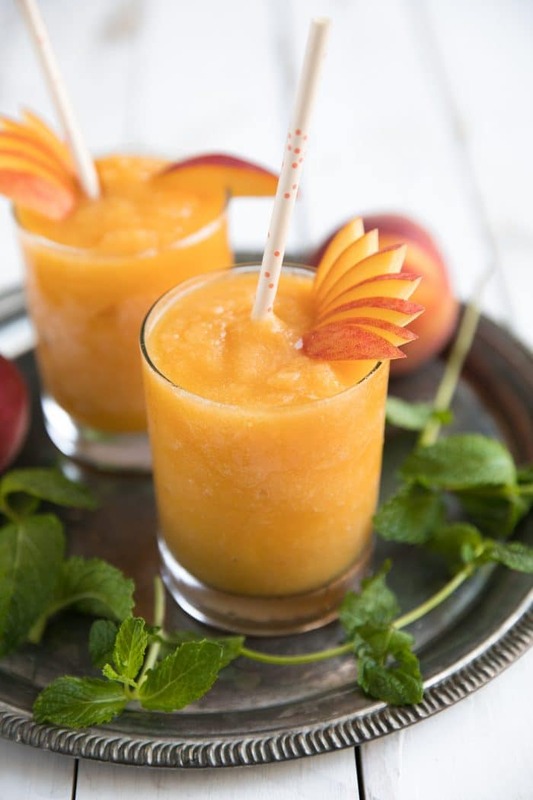 Frozen Peach Wine Slushies are made with just two simple ingredients – peaches and wine – for a blended, refreshing, and delicious summertime cocktail you’ll make over and over again. 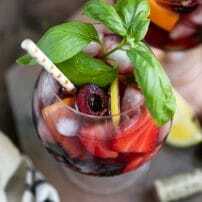 Learn how to make wine slushies below. 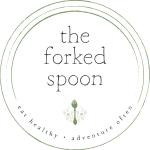 Cooking and drinking with wine is a favorite past time here at The Forked Spoon and include recipes such as Spiced Mulled Wine with Blackberries, Cherry Bruschetta Recipe, and Autumn Rosé Sangria with Apples and Pomegranates. That is literally it, my friends. I mean, this may be the most simple recipe on the face of this planet. You’re essentially making a wine smoothie with just two ingredients. I don’t know about you guys, but I’m pretty good at making smoothies with way more than two ingredients, so this is a piece of cake. 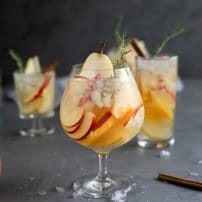 My first rule of thumb when picking out a wine to use in any kind of mixed drink or cocktail is to choose something that I know I like. In other words, would I drink it chilled and straight from the bottle? If yes, then the chances are pretty good that it will be a good choice for the drink I am preparing. For these particular wine slushies, however, I recommend a white that is neither too dry or too sweet. 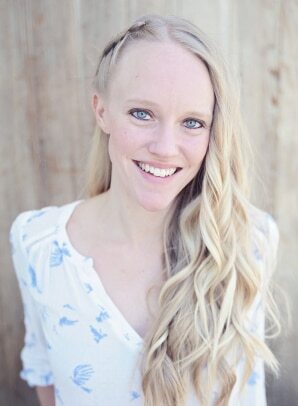 Keep in mind, however, that this is just my personal preference. 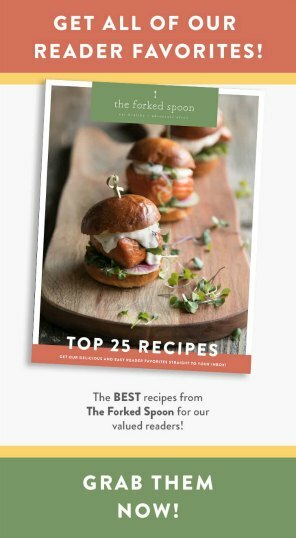 I doubt that there is a wrong white wine to use in this recipe…except for maybe chardonnay. Chardonnay would probably be my last choice. As for me, I used a light and somewhat fruity Pinot Grigio. The second choice would have been Sauvignon Blanc. And, of course, for those days when I really want something a little sweeter, a sweet Reisling or Moscato would be perfect. You need frozen peaches. How you obtain these frozen peaches is entirely up to you- will you buy pre-frozen peaches? or slice and freeze your own? It really doesn’t matter, just get some peaches. You need a bottle of wine. Optional! freeze half the bottle of wine in an ice cube tray overnight. But, let’s be honest, who remembers to do this? Or, who freezes half a bottle and saves the rest of the bottle for the next day? 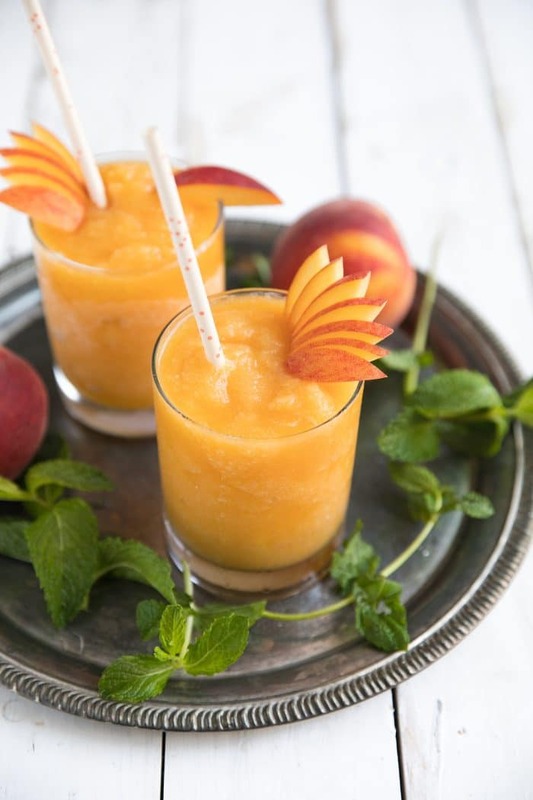 Blend the frozen peaches and wine (or wine cubes) in a blender until slushed. Careful! Don’t over process. Want it slushier? Freeze the wine slushies, taking care to mix every 20 minutes or so until the desired slushiness is reached. But what about the kiddos? As a mom, I totally get it. 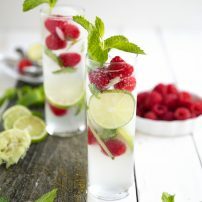 You spend all this time (aka no time) making this delicious grown-up summertime drink for you and all your friends or maybe just for you…and then your kid asks, where’s mine, mom? If you’re like me (a push-over mom) then you will probably have to offer your beautiful little life-sucking humans something or accept that your frozen wine slushie will be served with a side of whining. Simply replace the wine with either apple juice or white grape juice. Kids love ’em. 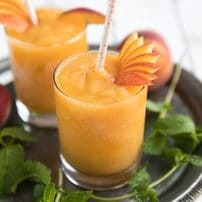 Frozen Peach Wine Slushies are made with just two simple ingredients - peaches and wine - for a blended, refreshing, and delicious summertime cocktail you'll make over and over again. 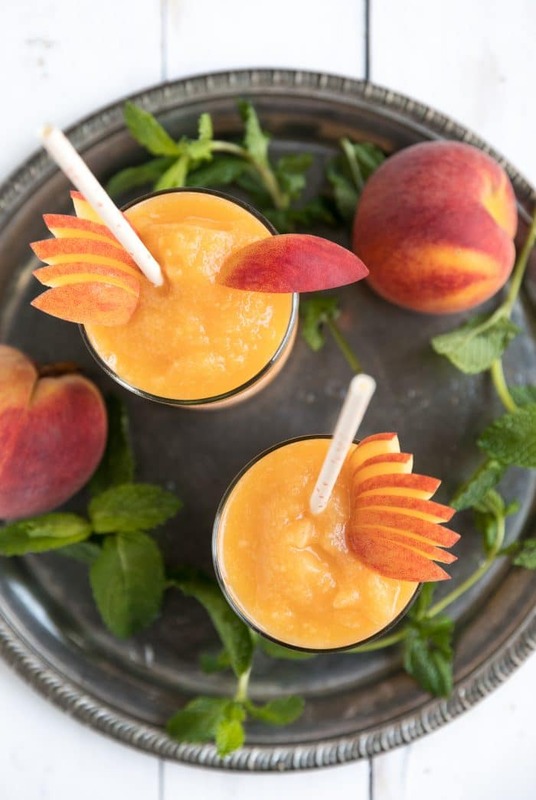 Add wine and frozen peaches to the bowl of a large high-speed blender. Gradually work up the blender speed to high and blend until peaches and wine are fully pureed. 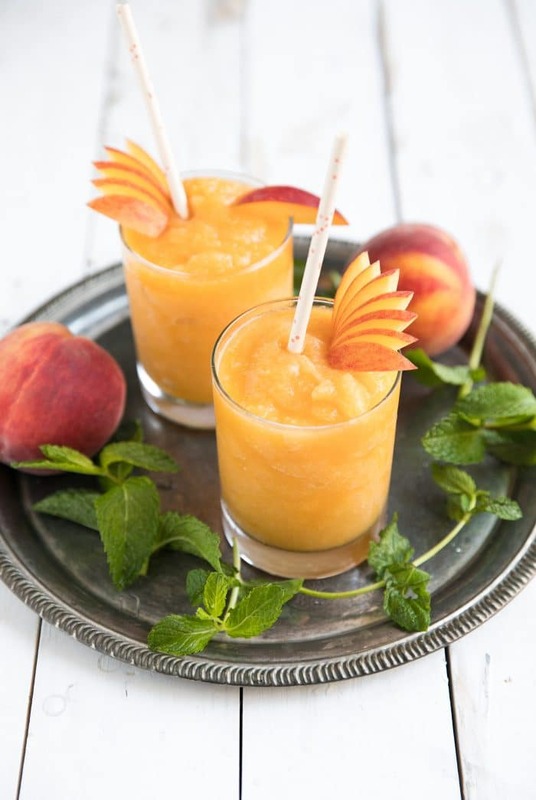 If you prefer a thicker slushie, you may either add additional frozen peaches and blend until desired thickness is reached, OR, place blender in the freezer and allow the wine slushie to freeze, stirring every 20 minutes or so, until desired consistency is reached.